Alisa Banks: " ... my work addresses the quest for understanding identity and all it encompasses. ... Each individual, quiet story coalesces to form a cultural memory that is shaped by experience, ritual, belief, places and relationships, and is called upon to explore connections. ... my project continues. It continues when stories that reference culture, the body, memory, and place are shared. It continues when an object relays an experience, either by paint, thread or paper. It continues." Dallas, Texas: A Bee Press, 2014. Edition of 4. (mull), thread (metal, cotton), graphite, incense, incense, button, tulle. Processes: inkjet printing, gouache, stitching, handwriting. Printed using Times New Roman font and handwriting. Pamphlet stitch binding and envelope wrap cover with button and thread loop closure. Signed and dated by the artist. Alisa Banks: "I am intrigued by the notion of 'who' a person is. . Air is the second in a series about the body (air = intelligence/thought) and memory (identity) based on the elements. 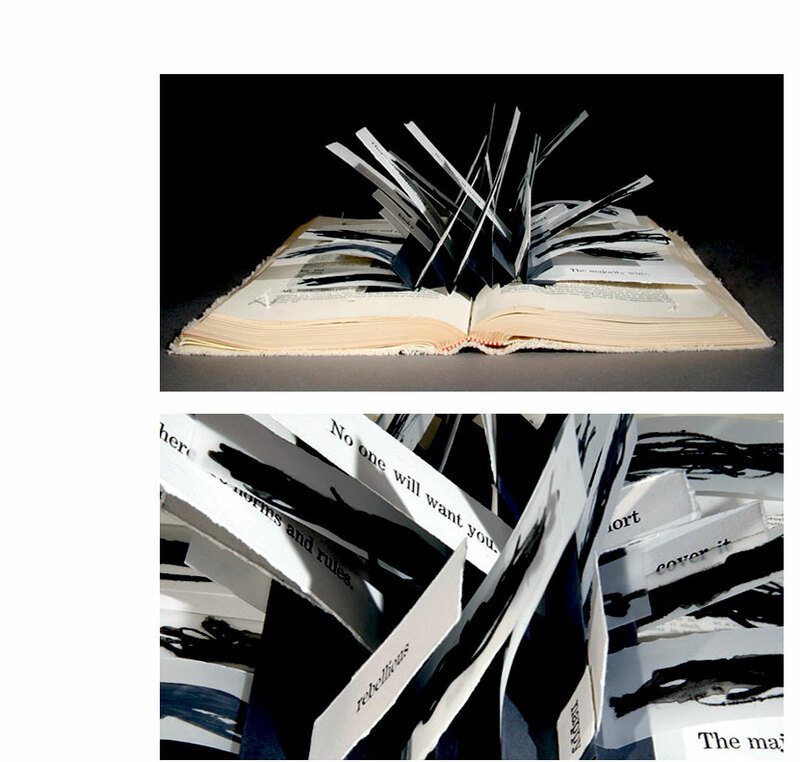 The text weaves three 'stories' throughout the book - the background (large text) features the idea of creating the book Air. 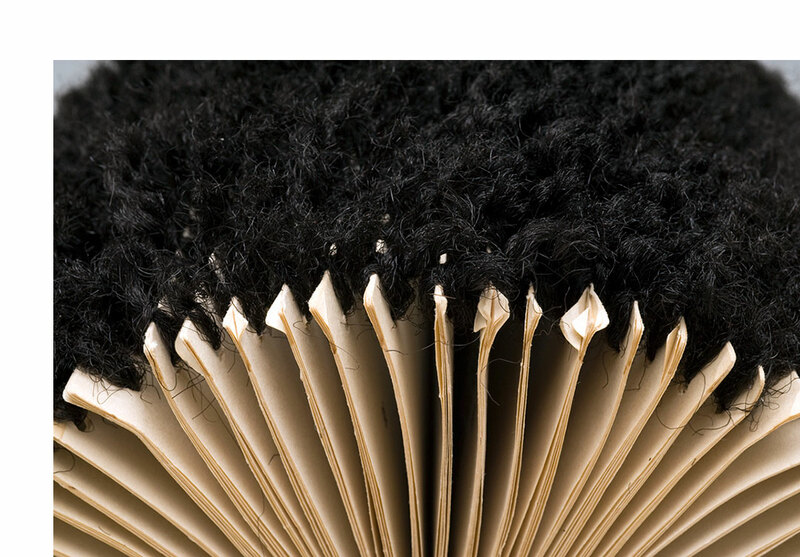 The background 'idea' coalesces in the center of the book and takes flight in the tulle 'cloud.' The idea goes from background (graphite) to foreground (thread). The second story is about air as breath and wind. This story winds itself around the other two throughout the book. 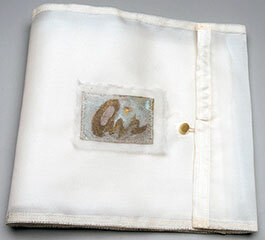 The third story is a series of vignettes featuring more concrete memories (freedom, wind, breath, flight) that are represented by the computer-generated text 'patches'." Dallas, Texas: A Bee Press, 2014. One-of-a-Kind. 11.75 x 14.75 x 3" wooden box with crocheted shutter-style swing out covers that latch closed. Top bound book suspended on rods mounted in the box. The first page lifts up; the back page is stationary. Beaded rosary and medallion attached to the upper wooden dowel. Materials: wood, beads, medallion, silk, plants, thread, pigment transfer, graphite, metal. Handwritten text. Signed by the artist. Alisa Banks: "Our Lady takes its form from the homemade shrines and gardens found in homes throughout southern Louisiana where Madonna statues grace many lawns. This particular Madonna is from my mother's front yard. "The text is a fragment of a story of longing to grow and gift flowers, and a snip about being from the country. The dried flowers are from my garden. The rosary is fashioned from beans grown and harvested by my aunt. The medallion is of St. Michael the Archangel (dispeller of demons)." Dallas, Texas: A Bee Press, 2016. One-of-a-Kind. 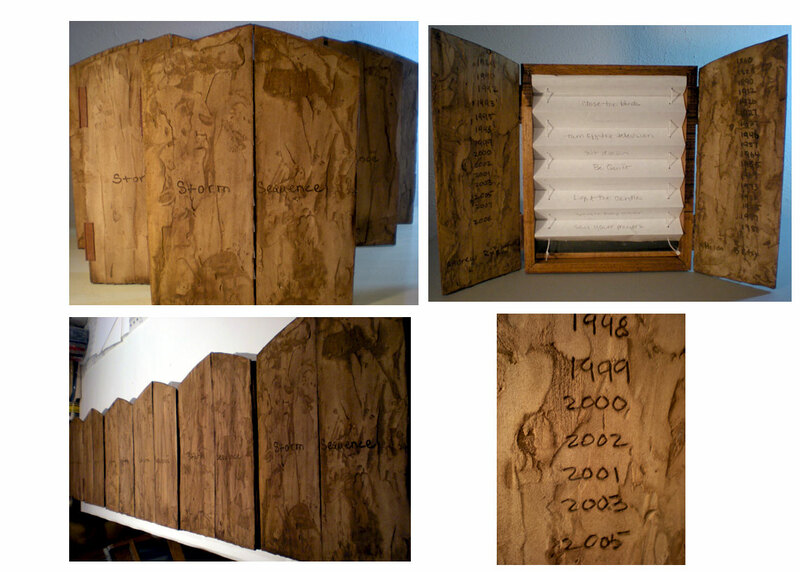 11 x 9.5 x 2.75" closed wooden box containing two mounted photos, two accordion books, and one scroll book. Materials: mahogany, metal, fabric (cotton), commercial papers (cotton rag), thread, batting, graphite. Digital printing and imagery using inkjet and Gil Sans Light font. Handwriting. Signed by the artist. Alisa Banks: "Many pre-twentieth century homes lacked built-in closets, and furniture, such as armoires and dressers and cabinets, was used to store clothing. Closets, by their very nature are memory keepers - even in the sparest environment they reveal something about the owner. In cases where generations of owners have stored items for safekeeping, the closet functions as a historical record. This piece features photos of clothing and stories spanning several generations. "As a child, the opportunity to peek into my grandmother's armoire was exhilarating - her armoire, like all closets, seemed intensely personal and off limits. A look was usually accompanied by a story that brought to life persons unknown but not forgotten. Years later, my grandmother long gone, the armoire remains a repository of memory, culture, history, and tradition. 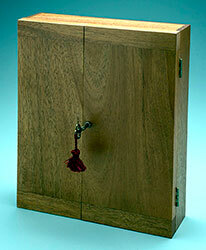 "Although the shape of the box structure differs from the original armoire, and 19th-century mahogany differs from that of present day, the work is made of the same type of wood (mahogany) as the original and is fashioned with double doors and a locking mechanism with a skeleton key, also as the original." Dallas, Texas: A Bee Press, 2007. One-of-a-Kind. 7 x 10 x 1.5" closed, 14 x 7" open. Altered book with flag inserts. Media: paper, canvas, graphite. Text digital and letterpress. Signed by the artist. 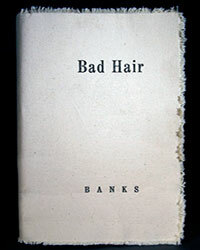 Alisa Banks: "Bad Hair is based on early struggles that many women of African descent underwent in order to gain acceptance of their natural (i.e. non-chemically altered) hair in the workplace. Though most of the women's styles were based on traditional western and African hairstyles (ex. a braided bob style), they were considered unacceptable for work. In many cases, the women were either asked to change their hairstyle or were fired. 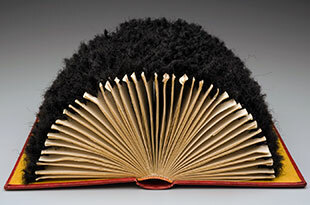 "The original text for Bad Hair is an old Texas Law book with the interior altered to house a flag book. The flags mimic locs or braids and contain text appearing in newspapers, primarily in op ed pieces. During my research for this piece, I was struck by the insensitivity and sheer meanness of many of the comments." Dallas, Texas: A Bee Press, 2016. Edition of 4. 8 x 6 x .5"; 6 pages. Accordion with pockets containing double-sided cards. Materials: Cotton plant, bronze, silk thread, cloth, watercolors, paper, ink, toner, plants, silk. Pigments prints and watercolor illustrations. Text printed in Lucida bright and handwritten. 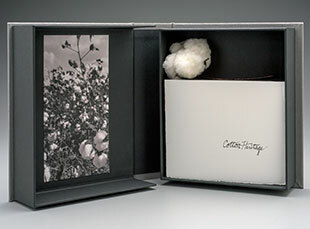 Custom clamshell box containing cotton plant with bronze electroplate stem, one paper signature with text, one cloth accordion. Signed and numbered by the artist. Cotton Heritage features an essay about the love of gardening and its connection to ancestral legacies. Alisa Banks, essay: "It all began with cotton - staple crop of the South that contributed to both forced dependence and independence. It provided support for some families and facilitated the destruction of others. ... It was a common link between large plantation, small farmer, sharecropper, and urban dweller. For many farming families of African descent, years of hardship 'growing cotton' as it relates agriculturally, culturally, and socially were punctuated by moments of happiness. ... Memories spoken and unspoken cast a shadow touching successive generations, contributing to seemingly unexplainable commonalities that are manifested in like fashion, such as strong connections to plants and gardens. Working in the soil, sharing space with plants offers a balm to the turbulent history that dwells beneath the patinated surface of those memories and reaches back to the ancestors." We always planted cotton on Good Friday, because it meant good luck, and would harvest it in the fall. We children rose at daybreak to go into the cotton fields. … To harvest the cotton, you have to pull the boll from the stem, which had sharp points that tore the skin. It seemed like we worked so hard and long for so little money. We would all pick cotton from sunup to sundown to get the fields harvested. Dallas, Texas: A Bee Press, 2009. Edition of 4 variants. 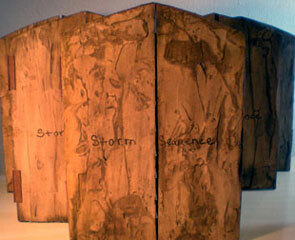 7 x 9.5 x 4.5", altered book Las mejores novelas cortas (The best short novels). Crocheted edges. Media: paper, leather, synthetic hair. Signed by the artist. 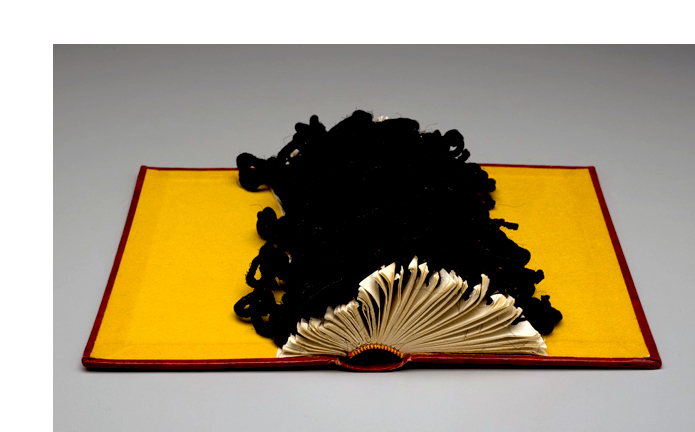 Alisa Banks: "Edges is a series of altered books that consist of hair crocheted onto the edges of page. The hair fiber lends texture and line – the embellishment (the action) occurs only on the edges, which symbolize the marginal, the end, the between, and duality. "Conceptually, regarding the books contents – the books were chosen primarily because of their intimate size and because they are written in Spanish; however, the actual stories do not relate to the overall piece." 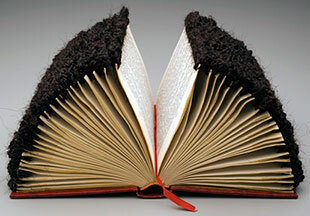 7 x 9.5 x 2", altered book Las mejores novelas cortas (The best short novels). Crocheted edges. Media: paper, leather, synthetic hair. Signed by the artist. 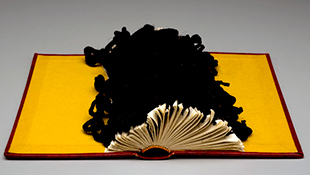 Alisa Banks: "Edges is a series of altered books that consist of hair crocheted onto the edges of page. The hair fiber lends texture and line - the embellishment (the action) occurs only on the edges, which symbolize the marginal, the end, the between, and duality. "Conceptually, regarding the books contents - the books were chosen primarily because of their intimate size and because they are written in Spanish; however, the actual stories do not relate to the overall piece." 11 x 9.5 x 1"; triptych. Materials: lace paper, cotton paper, toner, ink. Text printed in Lucida Bright font. Monoprint illustrations. 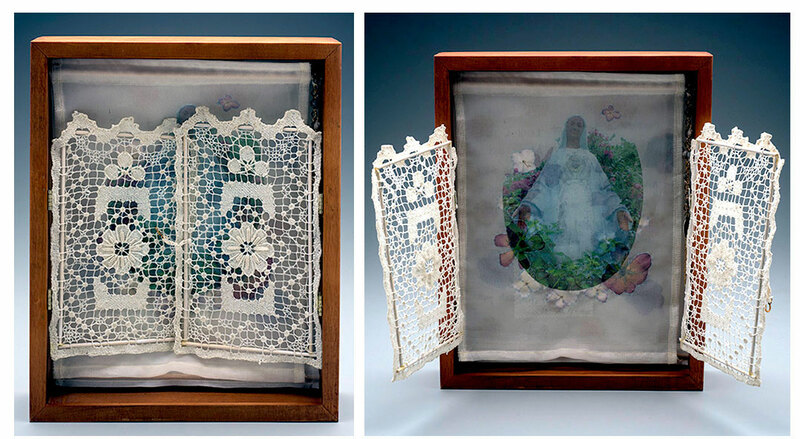 Triptych laid in cover of cloth netting with dried flowers imbedded. Presented in crocheted doily. 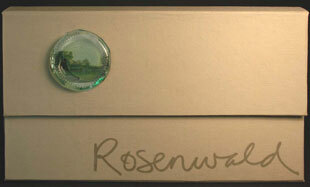 Laid in cloth covered clam shell box with colophon tipped on base interior. Signed by the artist. 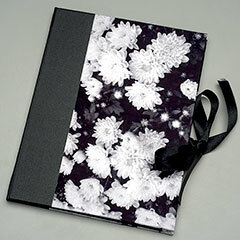 Black and white flower image on front lid. 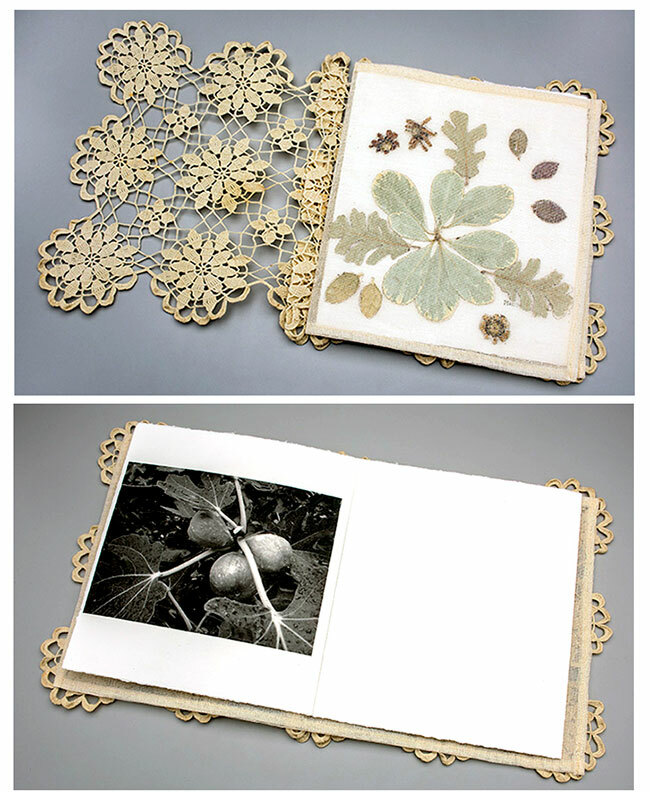 Alisa Banks: "Planted features an essay about the connection of gardening to ancestral legacies and monoprints of plants from the artist and her mother's garden as well as dried plants gathered from the artist's garden. "I'm always happy to visit gardens and am intrigued whenever passing by a gated garden - especially those that offer just a glimpse. These private spaces feed the imagination. The crocheted cover simulates garden gates. "Planted is the result of many conversations about plants and gardening." 8 x 6"; 4 pages. Materials: cotton, thread, cloth, paper, plant material (pittosporum, rosa, loropetalum, hydrangea, maple, oak), toner, ink. Monoprint imagery. Lucida Bright font. 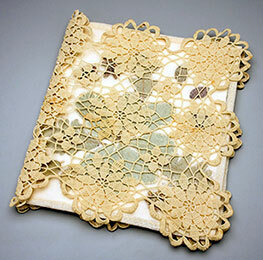 Lace paper folder with folded paper signature laid in. 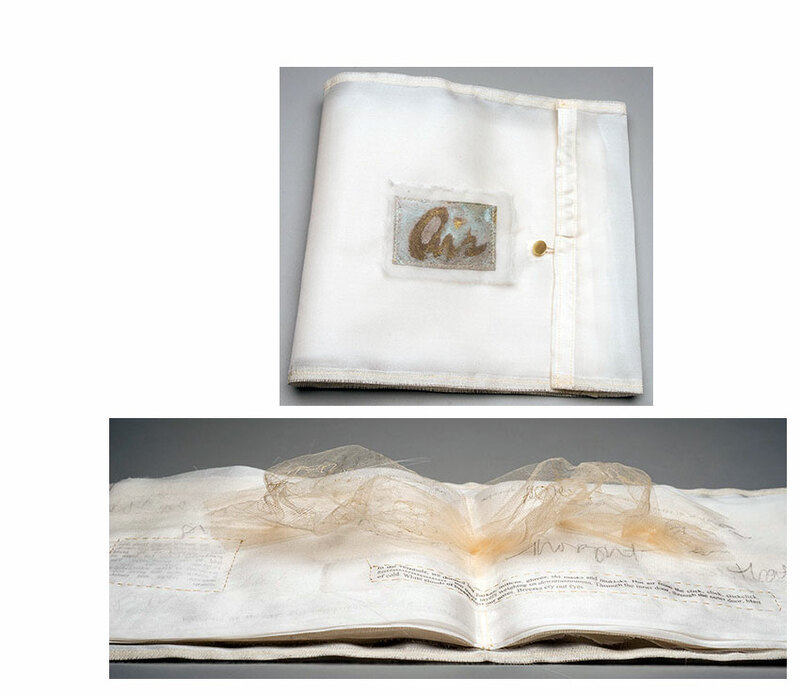 Paper covered boards with cloth spine and ribbon closure. Signed and numbered by the artist. This edition of Planted is based on the original unique item with the same name. Alisa Banks: "Planted features an essay on the garden as signifier. 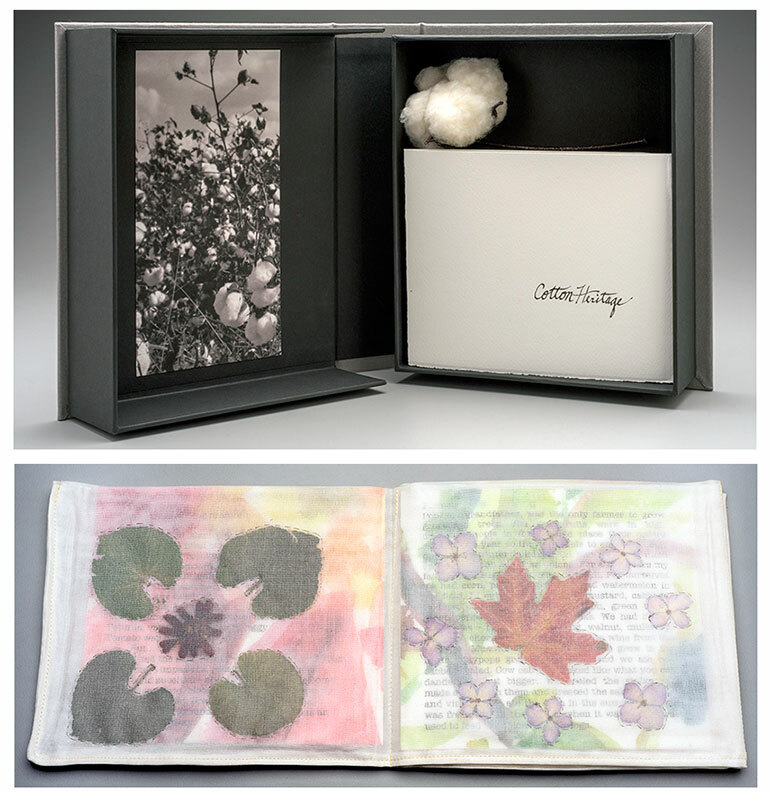 "The portfolio cover features a photo from my mother's garden. 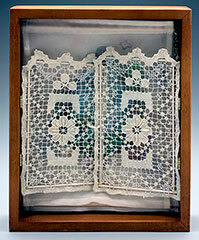 The lace paper folio simulates garden gates." Dallas, Texas: A Bee Press, 2013. Edition of 3. 7 x 12.25 x 2" box with scroll which opens to 12 x 50.5". Materials: linen (bookcloth), silk satin, silk organza, silk and cotton thread, glass, Bertini paper, Johannot paper silk tissue, linen book tape, graphite, oak. Box in woman's satchel style purse covered in book cloth with title in script. Attached to lid is school photo seen through the bottom of a glass bottle. Introduction: "From 1912 to 1932, the Julius Rosenwald Fund provided matching grants to African American communities in the South, for the purpose of building schools. Rosenwald tells the story of the importance that two such schools played in the lives of a family living in southern Louisiana. Told as a snapshot, the book recalls a story of hardship, determination and triumph." Alisa Banks: "During a trip to my parent's hometown in Louisiana, I passed by the spot where a gas station once stood. The story begins as I remember looking out across the street from the station years ago in that same spot, gazing at the school across the street. The image of the school sparks a flood of memories of family stories spanning two generations and is told in one sentence. The main character in the story is my aunt Vie, who was a teacher and then a librarian for the schools. While researching material for this book, I learned about the important role the Rosenwald schools played in the education of African Americans in the South in the early 20th century. I intended the book to be in a form that would allow it to be read by either unfolding it bit by bit to reveal the story, or hung on a wall and viewed in total. "Oddly, one issue was sourcing the glass bottle bottoms to imbed in the cover. No glass shop would cut the bottoms for me, so in an act of desperation I found a demo on U-Tube. The instructions outlined a method of blowing out the bottom by filling the glass with water and whacking it strategically on the lip, which was scary, but accurate. Who knew?!" Dallas, Texas: A Bee Press, 2011. Edition of 5. 11 x 14 x 1" shutter-shaped wooden tablet with inclusions. Alisa Banks: "Katrina non-withstanding, Louisiana weather history is fraught with floods, tornadoes, hurricanes, and other violent storms causing much damage and loss of life. Modern technology can offer little protection for those caught in them. This book outlines the spirit of a ritual that my aunt would perform when the weather turned ugly. On an approaching storm, all would be called inside and though natives would consider the ritual a normal occurrence giving it little attention, being a visitor, I considered it to be a dramatic performance. Years later, I learned that my aunt was not alone in performing the Storm Sequence – it was practiced in some form by many in Pointe Coupee parish and possibly beyond. More recently, my aunt informed me that she still performs the sequence, though in an abbreviated format. "The book is loosely patterned after the homemade shrines observed at some of my relatives homes. The numbers on the inside of the doors are years of documented significant damage caused by storms in the area. The blinds contain sequence steps and open to show a rainy view."